The question people always ask me when I tell them I live at Pearl Beach is this: what’s it like? At the height of summer and the holidays the size of the community increases dramatically. Houses are suddenly full of families, cars are parked across lawns and footpaths – which necessitates that venerable Pearl Beach tradition of walking in the middle of the road – and the shop and the café are jammed with customers. The feel of the place changes too: there’s an airy, sunny feel to Pearl Beach that is unique and, even when it’s overcast or raining, you feel as though you’re a long way from most things. One of the notable aspects of Pearl Beach is that when you drive down from Mt. Ettalong, or view the beach from the Palm Beach Ferry, it’s hard to tell just how many houses are here. From the water you can see the 20 or so houses on Coral Crescent, but beyond that all that’s visible is bush and a few houses peeking through the green. So too from the road: the high canopy trees camouflage the streets and the houses. And of course it’s those high trees that are home to the numerous native birds that give the place its distinctive sound. My wife Rachel and I have been living in Pearl Beach full time for 12 years, but my family’s connection goes back a lot further. My great grandfather built a house at 12 Amethyst Ave in the late 1920s, and my grandfather built another just a few doors down the street at number 4 about ten years later. My great uncle Roy and aunt Dorothy built a house at number 10, and at one time owned the blocks that are now numbers 6 and 8. The sale of land in Pearl Beach was done door to door in the north-eastern suburbs of Sydney, a comfortable middle class area that weathered the Depression and could afford the price of land, and my great grandfather and grandfather could afford to invest. Back in the 1960s when I was a kid, we stayed at my grandfather’s house on our school holidays. It was full of bulky 19th century furniture, mosquito netting over the beds, spooky black and white portraits of long-departed relatives and Boer War tin toy soldiers in the cupboards. 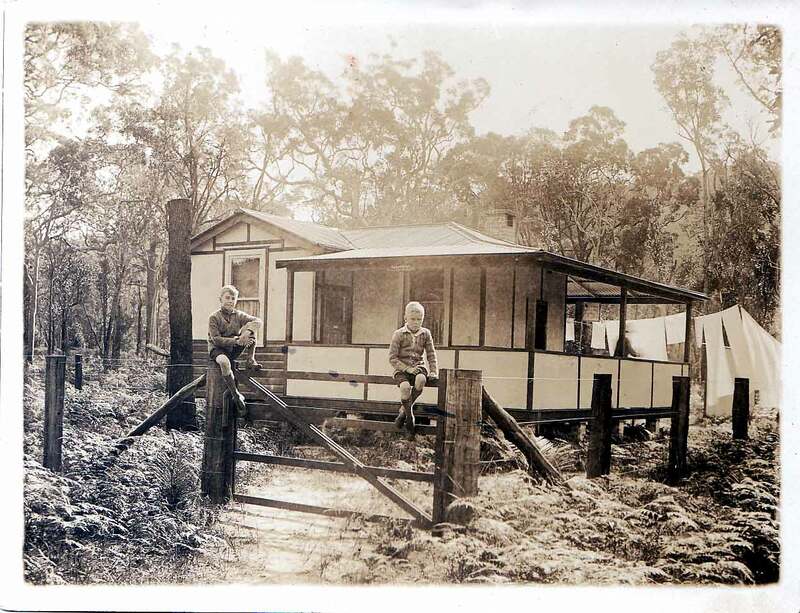 It was all pretty basic – bush showers and duckboards in the laundry-bathroom, a fuel stove in the kitchen, meals eaten at the dinner table set out on the veranda. And of course, there was no television. Happily, my great aunt and uncle were fans of wrestling and on Saturday and Sunday I’d join them for their hot lunches that were eaten from trays in front of my Uncle’s remote control TV. My abiding memories of Pearl Beach in those days are of its unsealed roads, and the white sands of Amethyst Avenue that burned your feet if you didn’t put on sandals for the walk to the beach. What is now Pearls on The Beach was a milk bar and on special occasions my Dad bought us kids ice creams. The sand covered stairs up from the beach into the shop were a grand gateway to the wonders of lollies and ice blocks, milk shakes and pies. In the 1960s the tree clearing done when Pearl Beach had first been logged, and then later subdivided for housing, was still evident. From Amethyst Avenue you could look across empty blocks to Emerald Avenue and beyond on one side, and to Tourmaline Avenue on the other. At one time you could stand out on my great grandfather’s veranda at number 12 and have a good view of the ocean through the trees. A permanent rift between my grandparents and my great aunt and uncle began because, according to Uncle Roy, my grandparents had built their house too far forward on the block, obscuring their view of the beach. The trees have grown back now and it’s hard to imagine that Pearl Beach was once a wide open, fern covered stretch of empty blocks. By the mid 1970s my grandfather had sold his place. My great aunt and uncle had moved next door from to a new house they’d built at number 8. Uncle Roy had a family fortune behind him thanks a broom making empire and he had retired in his mid 40s, still an impressive feat today, and he kindly let us holiday in his old house. The house at number 10 is like many family holiday houses: it’s a time capsule of various periods – the old furniture and knick knacks my relatives had left behind when they’d moved up from Sydney in the 1950s but didn’t want in the new place, and the various changes that my dad has made, like the brand new 1970s kitchen now set into a 1930s house. It has an intense, nostalgic atmosphere, a link to our family’s past and another time in Australia. I recall the mid to late 1970s as a time of significant change at Pearl Beach with an influx of new residents, many of them teachers and university lecturers, some of them what we’d call “greenies” today. Uncle Roy was outraged by their changes – the establishment of the dune erosion zone, the green buffer between the beach and the picnic area and playgrounds, the fencing of the bush areas, and the removal of decaying weather shelters. We now value those changes as farsighted – had the buffer zone not been created, the foreshore of Pearl Beach wouldn’t have been the green space it is today. My uncle was against it – he didn’t like change – another of the Pearl Beach community’s abiding traditions. Rachel and I moved here after 25 years of living in various parts of Sydney’s inner city. I thought I knew the beach, but quickly realised that off-season it was a very different place: from February until the beginning of winter proper it’s like having your own private summer – mid week the beach is often deserted save for a few tradies eating their lunches, or locals walking their dogs or fishing, while the sky remains defiantly blue long after the official holidays are over. In winter, and on those occasions when it gets cold, the shadows under the trees grow darker and the damp seems to rise from the sand. It often seems to me that’s when the past is most present in Pearl Beach. One thing that struck me when we began to live here full time was how little I knew about the bird life – I could name one or two birds but I couldn’t pick out any from their calls, save the kookaburra. I was given a pair of binoculars and a bird book one birthday and eventually came to recognise the birds – the Whiskered Tern, the Black Faced Cuckoo Shrike, the King Parrot and the elusive Glossy Tailed Cockatoos with their black and yellow feathers and drunken calls. It was also a revelation to discover that there were types of gum trees and you could learn to recognise them. My job takes me to Sydney a few times a week and it was on one such visit that I realised that I never wanted to move back there. That was after just six months on the Coast. We’ve moved a few times around Pearl Beach since we first arrived here and discovered that each corner of the place offers a different experience and perspective, while friends from Sydney have rented various holiday homes. It always strikes me how the feel of a place on Green Point Road or Crystal Avenue is very different from one on Cornelian Avenue, or how a modest bush outlook contrasts with the eagle’s nest view from high up on Jade Place, or the tranquil bush views near the tennis courts. Sitting in my home office, my blood chills when I hear a chain saw. Many new houses have been built in Pearl Beach since 2002 and many of them have been built on a block of land cleared of every tree and bush presumably to provide a blank slate for a new holiday house. I often wonder, if I had the money, would I build a swimming pool within 100 meters of the ocean? Would I level a 15-year-old house for a new mansion that takes up the entire block? Would I fill my house with brand new furniture and make sure every room had a giant flat screen TV? And would I, after I had built my faux Cape Cod-Swiss Chalet by the ocean, come and stay just 8 weeks a year? If I had the money I expect I wouldn’t even ask myself those questions, I’d just go ahead and do it. And while I don’t really begrudge others the right to spend their money how they want to, the sound of another tree falling to the saw is to me a tragedy – not only does it irrevocably change the beach and its environment, putting at risk the very thing that draws us here, it just seems like such a waste of resources. When we were kids we grew up in an Anglo Irish world. We were the great, great grandkids of English and Irish immigrants who had come to Australia to make a new life. Sure, they weren’t what are now called “genuine refugees”, they were economic migrants looking to make a better life for their families, and they brought their culture with them. To me history was ANZAC and WW2 and first settlers and explorers. Once, when snooping around in the laundry of my Great Aunt Dorothy’s house, I found a pile of photographs. One was of an Aboriginal family living in a humpy. I’d never really thought about the Indigenous people here. My aunt told me my uncle had taken the photo near the trig on the track between Pearl Beach and Patonga, probably in the late 1940s. The kids in the photo had the extended bellies of the malnourished, while the adults in the picture regarded the camera with blank stares. The photo told me in unambiguous terms that this place we all love so much is the land of another people. I respect that history now and try honour it by remembering that we are merely the custodians of this place before the next generation take over. I don’t want to forget the stories I’ve been told of Pearl Beach – like the stories of the old road around the bottom of Mt Ettalong, the RSL that once stood at the end of Amethyst Avenue, or how fisherman would nail the heads of their flat head catches to the Fish tree – the tree just near the bike racks with black marks where the nails still penetrate its wood. All of that is an invaluable history – a history of a place that is forever changing. Australia Day Speech, Pearl Beach, 2012.